The best Scottish employers for flexible and family friendly working cultures have been announced (5pm on 22/3/18) by Scotland’s leading work-life balance organisation, Family Friendly Working Scotland. 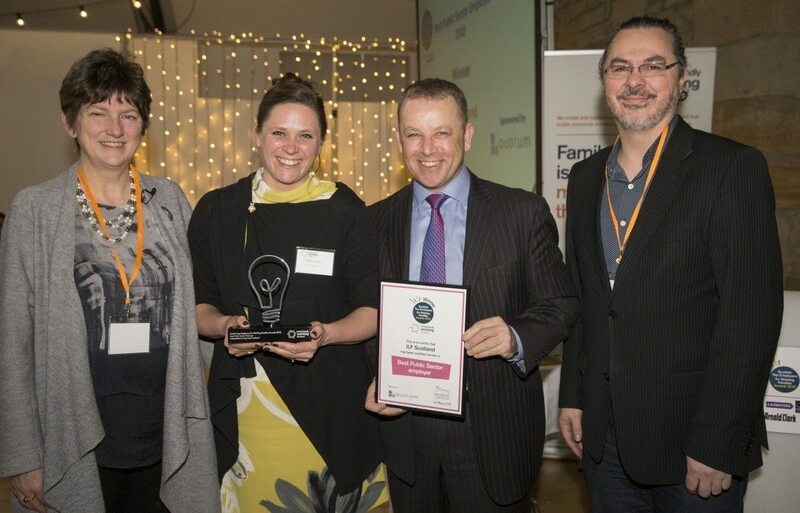 The Scottish Top Employers for Working Families Awards 2018 celebrate progressive employers that support staff to happily combine home and work life – and harness the business benefits this brings. Best Large Private Employer: Barclays – Banking group. Best SME Employer (Small): Senshi Digital – Digital design studio in Glasgow. Best SME Employer (Medium): Pursuit Marketing – Technology and B2B-focused marketing agency in Glasgow. Best Public Sector Employer: Independent Living Fund Scotland (ILF) – Based in Livingston, the ILF provides funding to 3,000 disabled people to help them live independently. Best Third Sector Employer: Young Enterprise Scotland (joint winner), Offers enterprise and entrepreneurship programmes to young people in Scotland. Based in Glasgow. Best Third Sector Employer: Includem (joint winner) Specialist charity working with vulnerable young people and their families on issues such as raising attainment, family breakdown and reducing youth offending. Based in Glasgow. Best for Innovation: Senshi Digital – As above. SST Sensing Ltd (Best SME – Medium). Designer and manufacturer of gas and fluid sensors, based in Coatbridge. Gillies and Mackay (Best SME – Small). Designer and manufacturer of sheds, garages and summerhouses, based in Errol, Perthshire. Historic Environment Scotland (Best Public Sector). Based in Edinburgh, the organisation manages historic locations and advises others on property and environment conservation issues. The event was hosted by Professor Jason Leitch, National Clinical Director at the Scottish Government and Host of TedX Glasgow 2017. Guest speakers included David Eustace, Creative Consultant and Chancellor of Edinburgh Napier University and Petra Wetzel, Founder and Managing Director of West Brewery. The awards are sponsored by Lloyds Banking Group, Dentons, City Building Glasgow, Scottish Power, Skills Development Scotland, Quorum, Arnold Clark and Pursuit Marketing.